"What I plan to do," I wrote back in March, "is show up with a laptop that will have a display of my four available books. I don't know if I can get Internet access there, so I'll have various pages from my website loaded onto the computer and available for viewing. And, of course, the Saving the Planet & Stuff trailer. This techie set-up, I've read, is how authors such as myself can make public appearances." So how did all this work out? Well, there are two factors to consider. 1. Sales. No sales have yet been generated as a result of this appearance. This isn't necessarily an indication of failure. 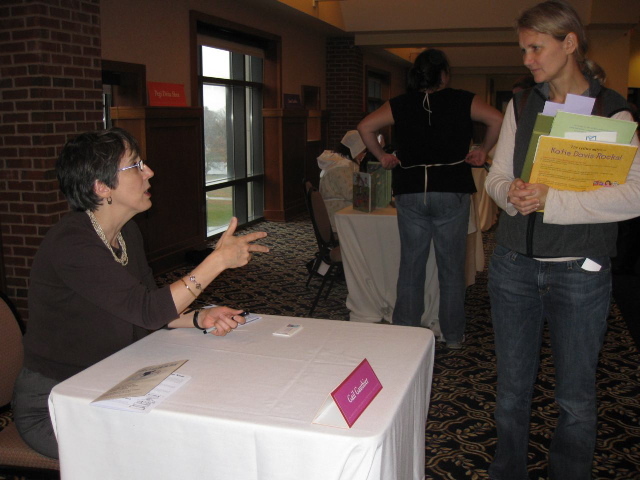 Many authors with paper-and-ink books making public appearances will make no sales at all. Selling just a few books at an appearance is about as much as most writers can hope for. Years ago, I had a bookseller tell me that if he could get four sales from an in-store appearance, he was happy. I've attended many book fairs that generated long lines for the one or two big names who were invited to draw customers while the rest of the writers sat looking bored or embarrassed. This is a fact life. 2. Connecting with the reading public. Here is where I saw a big difference between the NFA event and other events at which I've appeared. I definitely did more chatting and interacting than I've done in the past. I think this was due to two factors. A. Though there was a book sale going on, because I had eBooks, I did not expect to make any sales that evening. The only people who would be buying my self-published book, the one I was really promoting, would be people who owned a Kindle or a Nook, because those are the only two platforms we've published it to so far. In all likelihood they would make their purchase, if they were going to make one at all, at some other time, not right there. This took a big burden off my shoulders. There was no anxiety about whether I was going to "succeed" or "fail" with sales, because I went in there knowing there would be none right there on the spot. I was feeling kind of light-hearted. Jolly, even, which is not what anyone would call characteristic of me. B. Look at the next two pictures. Notice the difference between Gail with the laptop and without it? Without the laptop, I am behind a table, as most authors are at festivals and book fairs. There's always something between the writers and the public. You sit and hope someone will come talk to you. There is a stilted conversation between the person on one side of the table, who is the "writer," and the person on the other side of the table, who "is not." at other events, because I was moving around and could. I got into a discussion with a couple of people about Goodreads, one of whom had never heard of it. I wrote "Goodreads" on one of my business cards so she could remember it--and me, presumably. In fact, I gave out more business cards than I usually do. Which, okay, wasn't many. But it was still a different experience. The connecting with the reading public part of an appearance is important. In the short-term, invitations to speaking engagements and school visits can (and, in my case, have) come about because of connections made with the public. In the long-term, meeting other writers, librarians, teachers, and booksellers and making new Facebook friends of all kinds can help out down-the-line in ways we can't foresee at the time of the meetings. So I think there is a workable method that eBook writers can use for public appearances. A much bigger problem will be, I believe, finding opportunities for public appearances in the first place. Most festivals and book fairs are fundraisers for some group. (The one I attended this week was not.) The group sells the writers' books, just as a bookstore would, and the profit it makes is its fundraising. Groups aren't going to be able to sell an eBook, self-published or not. Kobo has an arrangement with independent bookstores that enables participating stores to keep a percentage of the sale of eBooks sold from their websites. Will there one day be a similar arrangement for book fair and festival organizers, which will then welcome eBook authors? Until there is, I don't know how often writers like myself will be appearing at public events.